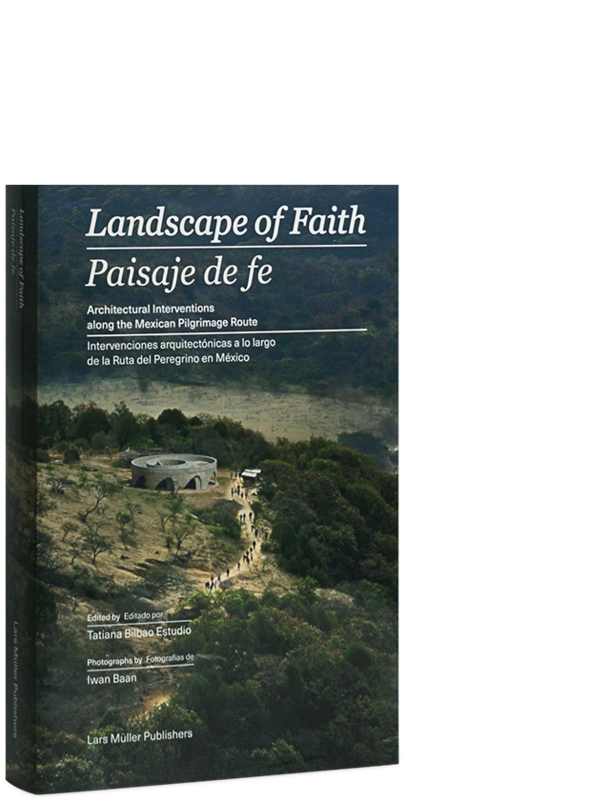 Landscape of Faith is a documentation of the way architecture can increase the identity of a pilgrimage route and add layers of meaning that reach far beyond the religious. The book presents sculptural and infrastructural interventions – in constant dialogue with the landscape –, which are spread along a pilgrimage route in central-western Mexico. It takes the reader on a journey along the route and lets them experience the act of devotion, faith and gratitude. Every year close to three million people trek from Ameca to Talpa de Allende to visit the site where the Virgin Mary is said to have appeared. La Ruta del Peregrino stretches a distance of 117 kilometers through the vast and imposing mountain range of Jalisco. In 2008 nine architectural studios were invited to improve the route’s infrastructure by creating areas for people to rest and reflect. Each introduced landmark sparks a dialogue about sustainability and austerity, landscape and architecture. All photographs are by Iwan Baan. The book features an essay on pilgrimage and architecture by Daniel Saldaña Paris. With projects by Ai Weiwei (FAKE Design), Luis Aldrete Arquitectos, Tatiana Bilbao Estudio, Christ & Gantenbein, Dellekamp Arquitectos, Alejandro Aravena (Elemental), Godoylab, HHF Architects and Rozana Montiel (periférica). other design firms to participate. Tatiana Bilbao, born in 1972, is a Mexican architect. She developed the architectural project along the Ruta del Peregrino and is a recipient of the Global Award for Sustainable Architecture by the LOCUS Foundation, Cité de l’Architecture in Paris, and the patronage of UNESCO.